Well, if you are a baseball fan, let me explain. If not, don't waste your time reading this. I'm very picky about hats. When I find one I like, I stick to it. Good hats are hard to find. So I've been dreading this day for a long time. My beloved blue hat, the hat I've been wearing in half the pictures on this blog, has slowly been falling apart. I've had it for over 6 years and worn it just about every day during that time. Ena gave it to me back in 2004 when we were still living in Himeji. Its been through law school, climbed mountains, been left in restaurants, had just about everything imaginable spilled on it, been across the Pacific twice and done a whole bunch of other stuff. But its developed quite a few holes and after some deep soul-searching I decided that it has earned a quiet life of semi-retirement as my back-up hat. In considering a replacement I made the decision right off the bat that I wanted to do something I haven't done since high school: make a baseball cap my regular hat. In high school I wore a New York Yankees cap and I don't think a photograph exists of me from the years 1990 thru 1995 without one. I gave them up after finishing high school, a year which also saw the retirement of Don Mattingly and along with it the end of my interest in the Yankees. I have some mixed feelings about wearing a baseball hat, which is related to the mixed feelings about Major League baseball since 2004. That was the year the Expos left Montreal. My high school days as a Yankee fan were more of a fling, my heart really always belonged to the Expos, the team my support naturally gravitated towards . From the first game I went to way back in 1980 with my grandpa, aunt and dad to the last in 1997 when I took my Dad to see Pedro Martinez pitch against the Dodgers just before he (er, my dad, not Pedro) retired and moved west I've been an Expos fan. It was a pretty big blow when they left town, even though I hadn't been to a game (or Montreal for that matter) for 7 years at that point. Anyway, my first choice for a hat to replace old blue would have been an Expos hat. Unfortunately those are not an easy to find item in Fukuoka. Remarkably however I actually did find one. But what I found was not an Expos hat as I remembered it, but one of these hip-hop style hats with a bunch of crap on it that look nothing like what Expos players actually wore. The Expos logo wasn't even on the front of the cap, it was way off to the side. Clearly that wouldn't do. My next thought was to buy a Hawks hat. After all, I am a Hawks fan and I do live in Fukuoka. But I couldn't bring myself to buy a Hawks hat. The Hawks hat has no soul. The Hawks hat has a big "S" and a big "H" in yellow letters. The "H", obviously, stands for "Hawks, but the "S" stands for "Softbank", the name of the team's corporate owner. That is one thing I really hate about Japanese teams, the fact that all of them (except the Yokohama Baystars and, occasionally, the Hiroshima Carp) are named not after the city they play in but after the company that owns them. Having a team that represents your city is something you can get behind. Having a team that represents some faceless corporation is not, especially if said corporation is in the decidedly consumer-unfriendly cell-phone business as Softbank is. More important from a hat-purchsing point of view is that the Hawk's hat has no tradition to go with it. They just have a revolving door of corporate owners and each time the owner changes they change the name, uniform, color scheme etc. 5 years ago they were the Daiei Hawks (department store chain) and a few years before that they had been the Nankai Hawks (railway company). So the current hat has only been around for a few seasons and I know that in a couple years from now it'll probably be replaced by god only knows what. Other teams here have a bit more consistency, like the Hanshin Tigers (railway company) and Yomiuri Giants (Newspaper company) that have been owned by the same company for a long time, but I don't cheer for them. So I had to bite the bullet and get a major league hat. Ena took me around town to do some hat shopping and we ended up at Hawkstown mall, which has a big baseball store. The selection of major league hats was basically limited to MLB teams which had Japanese players: the Yankees, Mariners, Dodgers, Astros, Red Sox and Pirates. I didn't think it would be right to go back to the Yankees hat and ruled that out right away. The "LA" on the Dodgers hat only served to remind me that Montreal fans now have something in common with old Brooklyn ones, so that was right out. The faint echo of a Yankee fan left in me couldn't stomach wearing a Red Sox hat and the Astros hat just looks stupid so I was left with a choice between the Mariners and the Pirates. I've been following the Mariners for a few seasons and considering them as a possible new favorite team for a while. I lived near Seattle for a few years and kind of like Ichiro. It was nice seeing Griffey go back there to end his career too, even though it didn' t work out too well this year. So the Mariners hat had all that going for it. But the Pirates hat? Looking at it, I just knew it was the right one. If there is one thing that contemporary American culture can truly be proud of, I would say it is the Pittsburgh Pirates baseball cap. Its brutal simplicity is perfection. A big yellow "P" on all-black and that is it. The Mariners cap with its complicated nautical logo looks very amateur in comparison. 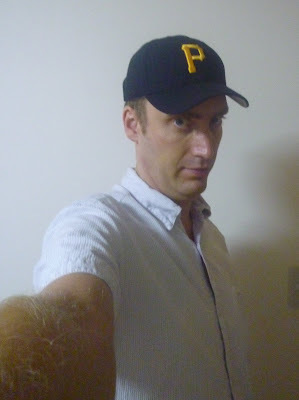 And the Pirates cap is more or less the same cap worn by all time greats like Honus Wagner (albeit in different colors), Roberto Clemente, Willie Stargell and pre-steroids Barry Bonds. What an icon. They were wearing that hat 100 years ago and they'll probably still be wearing it 100 from now. And the Pirates themselves? Well, they did play in the NL East against Montreal, which is sort of a black mark on them. But I absolutely love the fact that they are the worst team in Major League Baseball. I love the underdog. This year marked their 18th consecutive losing season. That isn't just a National League record in futility, it isn't just a major league record in futility: it is an all-time record in every single major professional team sport in North American history. Gotta love that. They also have some pitiable similarities to Montreal's final years: low attendance coupled with the threat of relocation looming in the background. I've never been to Pittsburgh and probably never will, but somehow the total miserable experience of that team translated into the perfect hat-sales marketing campaign focused directly on me. I assume this was by chance rather than design. So there it is: my hat shopping process described in a huge essay. Its a common refrain that women spend much more time and thought than men on shopping for clothes. But the sheer complexity, agonizing, self-doubt and trepidation that accompanied my decision to make what to anyone not a life-long baseball fan would consider a routine purchase has done a lot to dispel that myth for me.